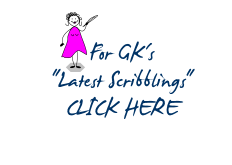 If you'd like to receive updates by email on my 'Latest Scribblings' and book releases etc, let me know and I'll add you to my mailing list. Please don't worry... I won't pass your information onto anyone else. You'll be able to unsubscribe at any time. Please also feel free to contact me with other queries by email too on gk@gkkingsley.com.